My wheel-thrown desert tower platters are one of my signature pieces. Each platter is hand-thrown and all of the images are hand-painted by me. The desert scenes are inspired by areas in Southern Utah. 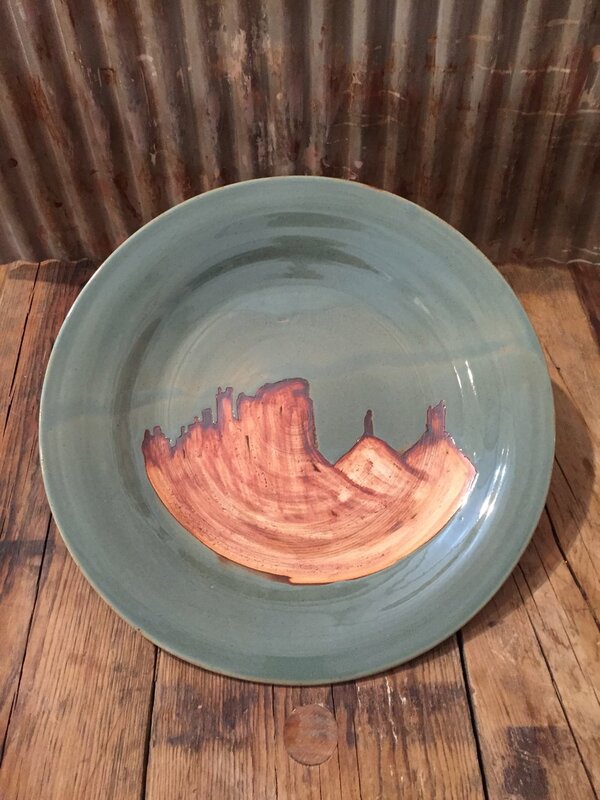 This platter is an image of the Bridger Jacks and the North and South Six Shooter Towers in the Bears Ears National Monument. To see other serving platters visit my Current Work page. Thank you for your interest but this mug is currently out of stock. The perfect tracks mug was created from a love of backcountry skiing in the Wasatch Mountains of Utah. The South Face of Mount Superior is a classic ski descent in Little Cottonwood Canyon, where my pottery studio is located. To Purchase: Due to an overwhelming demand for this mug I am not able to keep up with an in-stock page. Please send me a message to inquire about color and sizes that are in stock.